You loved the film, now get the award-winning soundtrack for Consequence, The Doll Chronicles! The album includes the highly requested Road to Darkness. Though the the film starts with Dark Theater, which is the series theme, The Road to Darkness is the true theme of Consequence and what I envisioned as the tone of the film, which is why it was used in the trailer. It was composed as an ongoing loop, but it was only used as a singular piece in the final film (try it as a loop and you'll understand). It also includes Dark Theater (The Doll Chronicles Theme) and the bonus track, iBoogie. Previously released as a single, it was originally composed for the film but ultimately unused in the final cut. It is played in an improvisational style that fit the original idea, but in the end didn't quite work in the final cut. It's a fun, boogie-woogie style piece which many of you have already enjoyed. While creating this particular score, I found myself exploring different styles and genres, settling for the cheesier, canned style for The Pick Up, and creating and performing a heavier, rock style for You're Mine Now. It was important to capture the transition from the smooth pick up into the Love Story as the Doll falls into the man's hands and into the Consequence. As with the Paranoia, The Doll Chronicles Soundtrack, I've included the Complete Film Audio, so that you can experience it as the full film piece it was conceived to be. Where can I get the album and songs from Consequence, The Doll Chronicles? copyright©2016 Franco Esteve. All rights reserved. Where can I watch the original film? If you haven't watched the award-winning short film, you can watch it right here in the embedded version below, or on Vimeo here. You've waited long enough! Watch the silent, experimental short film Consequence, The Doll Chronicles on Vimeo! Be sure to like it and share it! Thank you for your encouragement and support! Now, go watch it! With no dialog and a no-budget, slightly experimental format, Consequence, The Doll Chronicles, the third in The Doll Chronicles series of short films, projects a story about a girl called Doll and the consequences of falling for the wrong man. Franco Esteve's score, images, and wonderful acting from Marisa Reyes Durán and Bernat Pizà Galmés, help take you on their journey of love, drugs, and consequences. 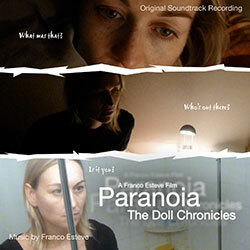 Paranoia, The Doll Chronicles Soundtrack is now available! The original soundtrack recording for the silent, experimental, horror short film, Paranoia, The Doll Chronicles has been released! It's the first release of music from The Doll Chronicles series of short films. I've included The Doll Chronicles theme, which is probably the piece of music I've received the most requests for (apart from maybe the trailer music for Consequence, The Doll Chronicles), as well as some of the soundscapes from the film. Apart from Dark Theater (The Doll Chronicles Theme), the main highlights are the main Paranoia music that plays throughout the film and the full film audio, a high quality version of the actual music and sounds from the entire film, beginning to end. What about the music from Reaction, The Doll Chronicles? What about iBoogie and other music from the series? iBoogie, originally composed for Consequence, The Doll Chronicles is available for purchase, by clicking here (or in iTunes here). You can also listen to it on Spotify here. I hope to release more music from the series throughout the year, with the music from Consequence, The Doll Chronicles next (though I'll release the film publicly first). That release will probably include some of the unused music as well. Where can I get the album and songs from Paranoia, The Doll Chronicles? copyright©2016 by Franco Esteve. All rights reserved. If you missed the original film, you can watch it below, or at Vimeo, by clicking here.